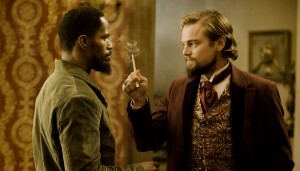 (L-R) JAMIE FOXX and LEONARDO DiCAPRIO star in .DJANGO UNCHAINED.” ©The Weinstein Company. CR: Andrew Cooper. Gleefully violent, thoroughly outrageous and incredibly entertaining, “Django Unchained” is like a deeper and considerably darker “Blazing Saddles” blessed with three of the most deliciously over-the-top performances of the year. Jamie Foxx is perfect as the vengeance-seeking freed slave Django, but Christoph Waltz, Leonardo DiCaprio and Samuel L. Jackson are so much fun to watch they outshine the title character. 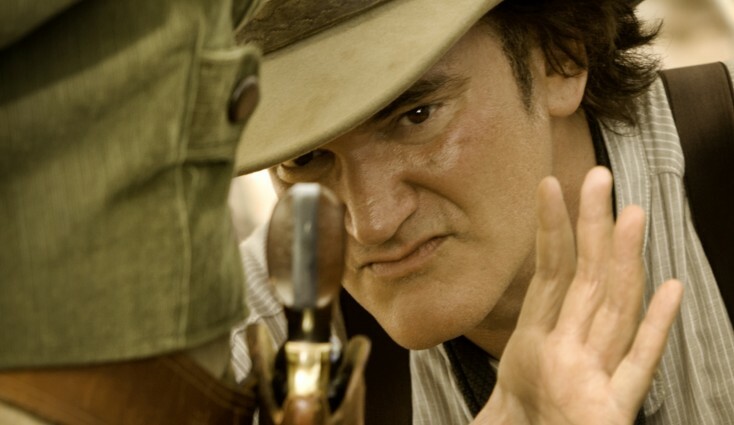 Director/writer Quentin Tarantino allegedly cut a half-hour from the movie’s running time prior to release. Yet even though “Django Unchained” still tops out at an epic 2 hours 45 minutes, it’s hard not to want even more of this wild, wild western. Waltz dazzles as Dr. King Schultz, a smooth-talking German dentist turned bounty hunter whose erudite patter tends to baffle and antagonize less educated mortals. He’s cool enough to shoot a sheriff dead, then calmly explain his justification for the act to a marshal and a street full of armed townsfolk without breaking a sweat. DiCaprio is cheerfully nasty as Calvin Candie, Broomhilda’s sadistic new owner who stages brutal death matches among his male slaves. A Francophile who can’t speak French, uses a foppish cigarette holder and has a relationship with his sister that may be more than familial, Calvin presides over a huge Mississippi plantation known as Candieland. The seeming soul of Southern hospitality, Candie delivers an interestingly politically incorrect observation about slavery in America that boils down to “why don’t they kill us?” Consider that foreshadowing. Samuel L. Jackson is laugh-out-loud hilarious as Candie’s cartoonishly subservient head house slave Stephen. The universe’s ultimate Uncle Tom who looks a lot like Uncle Ben, Stephen is outraged to near apoplexy at the idea of his master treating Django like a white man. Jackson’s genius is his ability to show the frighteningly sinister under Stephen’s shuck-and-jive surface, making him both funnier and scarier than any of the movie’s casually cruel Caucasians. Being a Tarantino film, the soundtrack includes some interesting song choices. Django first saddles up cowboy style to Jim Croce’s “I Got a Name.” A James Brown/Tupac Shakur mashup of “The Payback” and “Untouchable” accompanies an extended blood-splattered shootout. And considering the movie’s subject matter, Richie Havens’ frantic “Freedom” is a perfect fit. Although the movie probably sets a new record for most uses of the “N” word in a motion picture, it also could be the most anti-racism film of the new century. Django may get a little overenthusiastic about righting past wrongs (okay, make that very overenthusiastic), but it’s impossible not to have sympathy for his plight. Just as the Coen brothers surprised everyone by making a western that turned out to be one of their best films (“True Grit”), Tarantino would not have been on anyone’s short list of candidates to helm this kind of antebellum song of the deep south, tongue-in-cheek or not. But he pulls it off with sensational style, making “Django Unchained” one of the top films of the year.